There are all sorts of terms for dudes in this world the English term "MAN", is given to a dude just by virtue of him being a dude. The Hebrew term "GEVER" is given to a dude if he is a pretty cool dude. 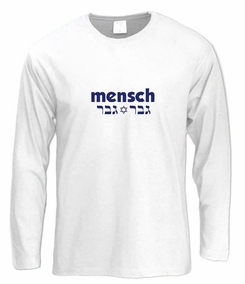 But the Yiddish term "MENCH" is given to a dude for being a good, obliging and righteous dude! We've created this awesome Yiddish T-shirt sporting the caption "Mench, Man, Gever" (Yiddish, Hebrew & English terms for man) and Israel's Star of David to celebrate Mench's around the world! So be a Mench and wear this T! Our t-shirts are made of 100% cotton and are long lasting with bright colors. Our products are all designed and printed in Israel.